With a vehicle over the roadway loop, the DEFLECTOMETERTM functions as a Sensitivity Meter. Automatic quantitative feedback of the loop system operation ensures that the detector is set to the most optimum sensitivity level to detect ALL vehicles, including motorcycles and high-bed vehicles. Following power-up or reset, the DEFLECTOMETERTM will indicate the loop frequency of the loop & loop network. Keeping your loops separated by at least 5 KHz avoids crosstalk problems and future service calls. 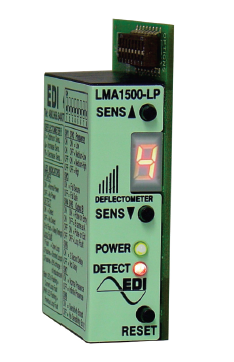 LMA-1500 operates on 12VDC, 24VDC, and 24VAC.